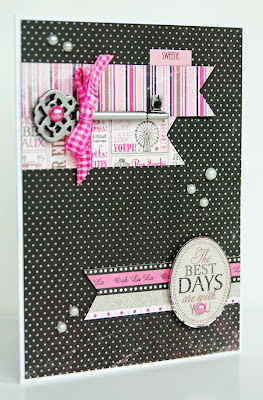 I've always loved pink, black, and white as a color combo so Carta Bella's Paris Girl collection is right up my alley. It's an added bonus to have a tween girl who is in love with all things Paris too because this collection has gotten a good workout since I've gotten it. I put this card together, just for fun, to have a "girly" card on hand. I may put it aside and use it for Alexa's upcoming 12th birthday. I'll be back tomorrow with another card to share. Have a great day! I love this color combo and design. PS: I love your new profile picture! Beautiful!! I loveeeeeeeeee the colors and the key!! Very pretty! The key is a nice touch for a bday card. so cute Lisa!!! love the black andpink!! what a fun card!!! Love the pink and black and all the details!!! This is very cute! Great colors and I love the key! Love this card. So pretty. and Victoria Secret colors rock. Oh, I love pink and black - lovely job!! Love your new profile picture - you are cute as a button! funny, my 11 year old daughter LOVES Paris right now too :) love the colors in this and the flags! Great card Lisa! The key is so much fun and I'm loving the pearls! Such a pretty card. I like how you added a pearl to the 'o' in you. I love black with pink accents and how cute is the key. This is so cute Lisa!! Love that fun key and the mix of Pink, Black, and White! Great use of the Carta Bella! Lovely design! I really like the pink on black. Love how you decorated the key! oh yay!!! so glad you linked up over at Simon!!!! This is a gorgeous paper pack. Love what you did with it, this card is stunning. I love this color combo too. So pretty. The pink just pops! Lisa, I love this card. The color combo you used is one of my faves. And right now I love keys - great touch. Thank you for linking up to Whimsical Wednesday. Hope you will visit again.